Clapper the Seal is an Animal Friend who appears in Donkey Kong Country 2: Diddy's Kong Quest and Donkey Kong Land 2, in the levels Lava Lagoon and Clapper's Cavern. A character resembling Clapper, named Seal, later appears in Donkey Kong 64. Clapper always sits next to a body of water stationary, and he has the ability to cool the water temperature. To do so, Diddy and Dixie Kong must jump on Clapper, who breathes into the water and then claps his flippers (hence his name). In Lava Lagoon, Clapper cools down the boiling lava water, allowing Diddy and Dixie Kong to safely swim through. In Clapper's Cavern, a level bearing his name, Clapper freezes the water into solid ice, allowing the Kongs to safely cross above Snapjaw. After a while, the water that Clapper had cooled changes back into its original temperature; therefore the Kongs should quickly move through the level. Since the water temperature only changes temporarily, a few Clappers appear throughout both Lava Lagoon and Clapper's Cavern to compensate. Clapper is the only Animal Friend in the game who does not have its own Animal Crate. Clapper got his name from the popular depiction of seals clapping with their flippers, which he himself does in the games. He has silver fur, large eyes, and a tan snout with a black nose and five whiskers on each side. Like all seals, he has four flippers, the hind two of which somewhat resemble a fluked whale tail. 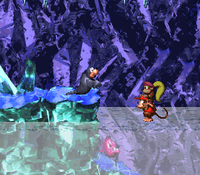 In Donkey Kong Country 2, Clapper makes stock sound effect of seals every few seconds. "Most seals can't bring boiling water down to room temperature or turn water to ice, but Clapper can! Bounce on his back, and he'll be happy to demonstrate." This page was last edited on April 12, 2019, at 21:32.